Image: Workers Art Coalition, Illuminating History, 2017. Installation and sound work derived from workers oral history WAC produced for the Library of Congress, as part of Culture Push’s – The Archive of Affect for NURTUREart in Brooklyn. Courtesy of Workers Art Coalition. See more here and here. Introducing the Workers Art Coalition (WAC) NYC, a collective of construction workers and artists participating in New Poetics of Labor 2018. 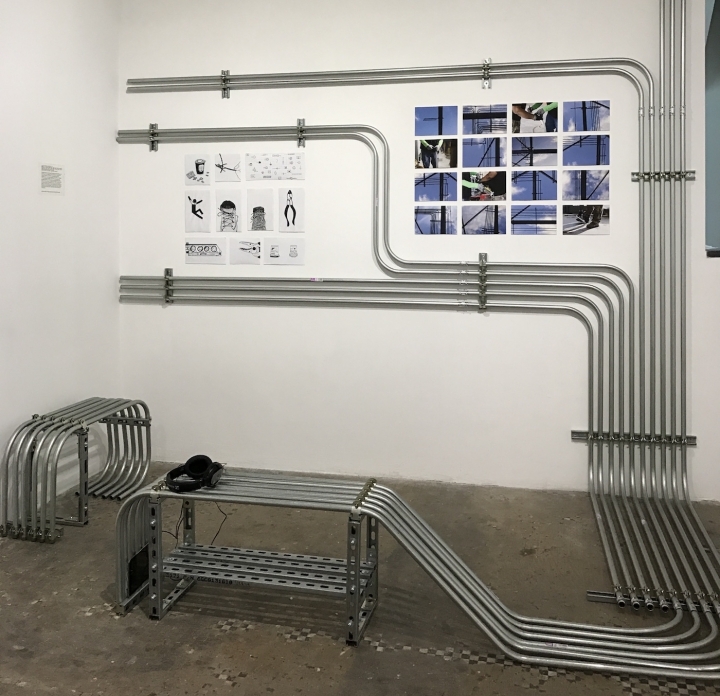 WAC is a collective of construction workers and artists who invoke labor’s role in combating climate change, classism, racism, and sexism through public art, artisanship and protest. Their work has been commissioned for the People’s Climate March(es), the Fight for 15, the Precarious Workers Pageant in Venice, the International Federation of Global Workers Education Summit in Peru, and a workers oral history project for the Library of Congress. WAC created two workers art pavilions, the second constructed on the anniversary of the World’s Fair (“The World of Tomorrow”) where, at the same site, an attempt was made to produce a “Temple of Labor” in 1939. The collective seeks further ways art and labor can be marshaled in cultural expression and collective struggle. WAC es un colectivo de trabajadores de construcción y artistas que invocan el papel de los trabajadores en la lucha contra el cambio climático, el clasismo, el racismo y el sexismo a través del arte público, lo artesanal y la protesta. Su trabajo ha sido encargado para la Marcha Climática del Pueblo, Lucha por 15, el Desfile de Trabajadores Precarios en Venecia, FIAET – federación internacional de asociaciones de educación obrera en Perú, y un proyecto de historia oral de los trabajadores para la Biblioteca del Congreso. WAC creó dos pabellones de arte para los trabajadores, el segundo construido en el aniversario de la Feria Mundial (“El mundo del mañana”) donde, en el mismo sitio, se hizo un intento de producir un “Templo del Trabajo” en 1939. El colectivo busca otras formas en que el arte y el trabajo pueden organizarse en la expresión cultural y la lucha colectiva. Workers Pavilion, 2013. Corona Plaza, Queens, NY. Photo by Edouard Rogers. Also see WORKERS PAVILION 2.0 – OPEN ENGAGEMENT 2014.